As software providers and installers we naturally have to keep a close eye on what is happening within the IT industry as a whole to ensure that we are providing the best information to our customers. As part of this we have been keeping a close eye on Windows Vista and its stability. It is fair to say that for an entirely new build of Windows it is by far the most stable new version that Microsoft has released. It is also important to point out that many of the problems that are experienced by new versions of Windows are often not directly down to Microsoft, but rather down the the software drivers that are required for the new versions. The software drivers are the pieces of software that act as translators for additional hardware that you may add to your machine, such as printers, scanners, digital cameras etc. There is a huge amount of hardware that is supported by Microsoft Windows and it is little surprise that problems will creep in from some hardware vendors. However, as Microsoft has started to release Service Pack 1 for Vista, so it appears that Vista´s stability has started to suffer further. Indeed there have been widely reported issues of problems with Windows Update and Microsoft Update which have casued Vista systems to crash whilst attempting to install pre-requisite updates prior to the installation of Service Pack 1. With many people keeping an eye on these issues, particularly IT managers of larger businesses, it is no wonder that Windows XP Professional is still being demanded by many. Indeed Dell, as a major supplier of machines to all areas of the market place, have continued to provide Windows XP Professional on a selected number of machines. However, they have always been recommending Windows Vista - until now. When looking at a Vostro 400 machine, the standard Windows version selected is Windows Vista - but Dell recommends that you ´Upgrade´ to Windows XP Professional - for an extra £30.00. 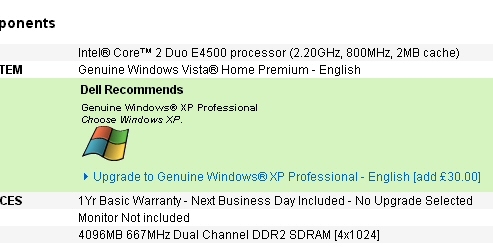 Now it has to be said the Windows Vista version offered is Vista Home Premium and so you can argue that since XP Professional is a ´professional´ version then it could be deemed an ´upgrade´. But to us, it looks like Dell is really calling Vista a ´downgrade´! Business Management Software - FREE! We will soon be releasing a FREE version of Business Builder. Find out more about our limited free licences. "Business Builder offers you a saving of time and money providing you with a cost-saving integrated business solution."